Iran vs. Israel: Who's Making the Threats? 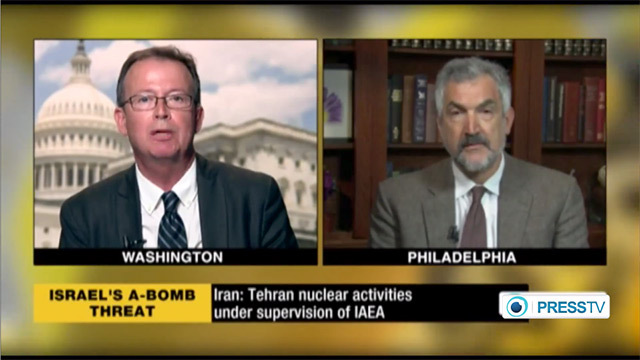 Pipes: Do I think the U.S. government should bomb the Iranian nuclear installations? Absolutely, and the sooner the better. Moderator: No, should Israel do it? Pipes: I would prefer the United States government do it but if the United States government won't do it, I hope the Israelis will do it, be otherwise we have madmen in Tehran controlling nuclear weapons that threaten the Iranian population, the Israeli population, the American population, and many other populations besides. Best to get rid of this in advance, such as the Israelis did in Iraq in 1981 and in Syria in 2007. 1. Iran finances and provides arms to Hamas which periodically attacks Israel. 2. Iran finances and provides arms to Hezbollah which periodically attacks Israel.